These doughnuts are incredibly soft, fluffy, and perfectly sweet. They can be made and shaped ahead of time so the second rise is done overnight in the fridge. That way you can wake up and fry! Taste: What I love about these is that they’re absolutely sweet, without being as cloying as Krispy Kreme doughnuts. Texture: The glaze is super rich and thick, while the doughnuts have an ever so slightly golden crisp exterior, but super light and fluffy interior. Ease: There’s yeast and frying involved, so this is definitely more of a weekend or holiday baking project. The good news is the dough can be made ahead of time! Cons: Your house may smell like fry oil afterwards, which is why I always crack the kitchen window even if it’s hot outside. Is there anything better in this world than a freshly glazed still-warm doughnuts? It’s the epitome of comfort food in my book. I love when the doughnut is so light, fluffy, and warm that it practically melts in your mouth. Although baked doughnuts can be delicious, nothing compares to that sensation. Is your mouth watering yet? I guess you’ll just have to add these Glazed Doughnuts to your “to bake” list right this moment! If you do make a batch, be sure to take a picture and tag me on Instagram with #handletheheat so we can all see. 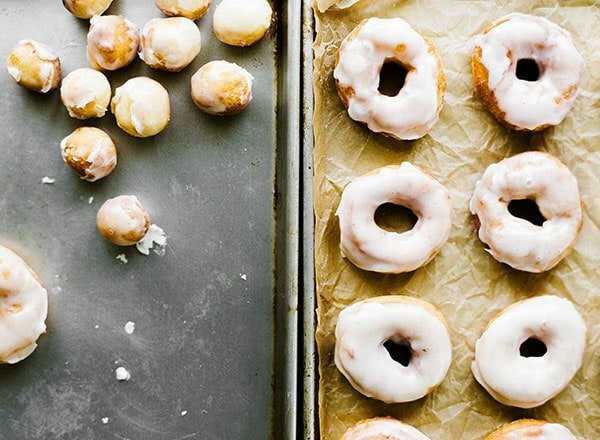 If you don’t have a doughnut cutter, you can use a biscuit cutter + piping tip or bottle cap to cut out shapes. Get creative! Yes, this recipe must be FRIED! It truly is best that way. If you don’t want to deal with frying, the doughnut base in this recipe is my favorite for baking. I always use a thermometer when I’m deep frying, so I can make sure the oil is the perfect temperature. Too cold and your doughnuts will be greasy. Too hot and your doughnuts will be overly browned on the outside and undercooked in the center. Yes, you can make these ahead of time! The dough can be made and shaped and allowed to rise in the fridge overnight. Let the dough come to room temperature as you heat your oil. Instant yeast is your friend here! It makes bringing the dough together super simple because it requires no proofing and rises faster. However, if you don’t have instant yeast you can use the same amount of active dry yeast. Simply combine the yeast with the warm milk for 5 minutes to proof before adding into the recipe. Like most fried foods, the doughnuts are definitely best served the day they’re made. I always like the allow the glaze to set for at least 20 minutes before serving. That way they truly look and taste like gourmet doughnuts. If you want to get creative with the glazes, I have a free download with my top 5 doughnut glaze recipes just below. When I’m frying a batch of doughnuts, I’ll usually make at least two glaze flavors to make sure everyone gets their favorite! In a large bowl, mix together all the ingredients until well combined. Let the dough rest for 5 minutes. Knead the dough with an electric mixer fitted with a dough hook or by hand until smooth and soft, about 6 to 8 minutes. Place the dough in a large oiled bowl, cover with plastic wrap and let rise in a warm place until doubled in size, about 1 1/2 to 2 hours. Punch the dough down and turn it out onto a lightly floured work surface. Roll the dough out into 1/4-inch thickness and cut with a doughnut cutter or with a large round cutter and a small cutter for the holes. Cover the dough with a clean kitchen towel and let rise until doubled in size, about 1 hour. At this point the just-cut doughnuts can be covered and allowed to rise in the fridge overnight. Let come to room temperature before frying. Heat the oil in a large, deep, and heavy pan to 350°F. Place three doughnuts in the oil at a time and fry until golden brown, about 1 minute per side. Do not overcook the doughnuts. Drain on a paper towel-lined plate. Mix all ingredients in a bowl with a whisk until smooth. Immerse each doughnut into the glaze. 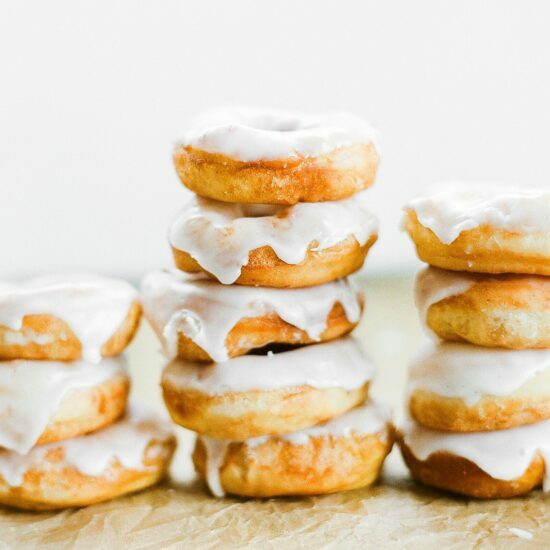 Place glazed doughnuts on a wire rack above a lined sheet pan to catch any excess glaze. Let sit for 20 minutes until glaze is set before serving. They look yuum yuum.plz can I exclude d corn syrup,or replace it? If you can’t get it you can just exclude it. The glaze won’t be quite as shiny and similar to bakery style doughnuts, but will still be delish. Doughnuts have been on my ‘to bake’ list for so long! I’m always put off by the deep frying as I’ve never attempted it before. I’m so keen to try this recipe though, is a large saucepan suitable? 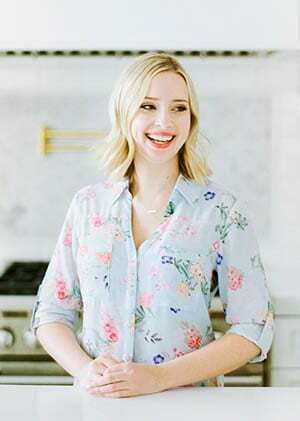 Hi, Emma! I hope you’ll give these a try then 🙂 A large saucepan should work just fine. Any tips for frying? I did everything you said, but the doughnuts just tasted like oil and were not even close to being edible. Love the tutorial, are we to keep the donuts to cool before applying the glaze? I’ve found with other recipes the glaze sets and then starts melting, however I dipped the donuts soon after frying which probably meant it was too hot?